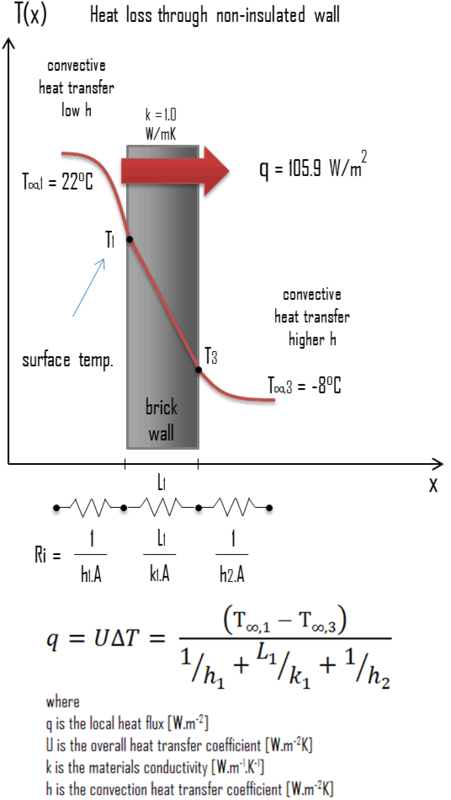 Cavity wall insulation is a thermal insulation method used to reduce heat loss through a cavity wall by filling the air space with thermal insulator. These materials (e.g. polyurethane) function simply by having a large number of gas-filled pockets which prevent large-scale convection. 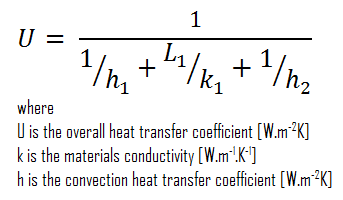 Alternation of gas pocket and solid material causes that the heat must be transferred through many interfaces causing rapid decrease in heat transfer coefficient. During construction of new buildings, cavities are often filled with glass wool or rock wool panels placed between the two leaves (sides) of the wall. Polyurethane foam (PUR) is a closed cell thermoset polymer. 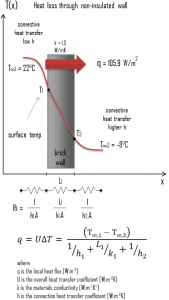 Polyurethane foam insulation is available in closed-cell and open-cell formulas. Polyurethane foam can be used as cavity wall insulation or as roof insulation, floor insulation, pipe insulation, insulation of industrial installations. Insulating panels made from PUR can be applied to all elements of the building envelope. Another important aspect is that PUR can also be injected into existing cavity walls, by using the existing openings and some extra holes. For existing buildings that were not built with insulated cavities, a fibrous material such as cellulose insulation or glass wool is blown into the cavity through suitably drilled holes until it fills the entire wall space. Loose-fill insulation consists of small particles of fiber, foam, or other materials. The most common types of materials used for loose-fill insulation include cellulose, glass wool, and rock wool. Loose-fill materials can be blown into attics and finished wall cavities. For existing buildings that were not built with insulated cavities, a fibrous material such as cellulose insulation or glass wool is blown into the cavity through suitably drilled holes until it fills the entire wall space. Loose-fill insulation consists of small particles of fiber, foam, or other materials. The most common types of materials used for loose-fill insulation include cellulose, glass wool, and rock wool. Cellulose insulation is made from recycled paper products, primarily newspapers and has a very high recycled material content. Glass wool (originally known also as fiberglass) is an insulating material made from fibres of glass arranged using a binder into a texture similar to wool. Stone wool, also known as rock wool, is based on natural minerals present in large quantities throughout the earth, e.g. volcanic rock, typically basalt or dolomite. These small particles made from these materials form an insulation material that can conform to any space without disturbing structures or finishes. One of methods is Wet-spray cellulose insulation. This type insulation is similar to loose-fill insulation, but is applied with a small quantity of water to help the cellulose bind to the inside of open wall cavities. Cellulose insulation is made from recycled paper products, primarily newspapers and has a very high recycled material content. The obtained cellulose fibres have a wool like structure (therefore paper wool). In order to make the cellulose fibres moisture and flame retardant, boric acid or ammonium sulfate are added. Cellulose insulation is used in wall and roof cavities to insulate, draught proof and reduce free noise. Cellulose insulation is used in both new and existing homes, usually as loose-fill in open attic installations and dense packed in building cavities. Cellulose and the other loose-fill materials can be blown into attics, finished wall cavities, and hard-to-reach areas. 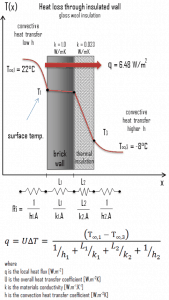 Typical thermal conductivity values for cellulose insulation are between 0.022 and 0.035W/m∙K. Now assume thermal insulation on the outer side of this wall. 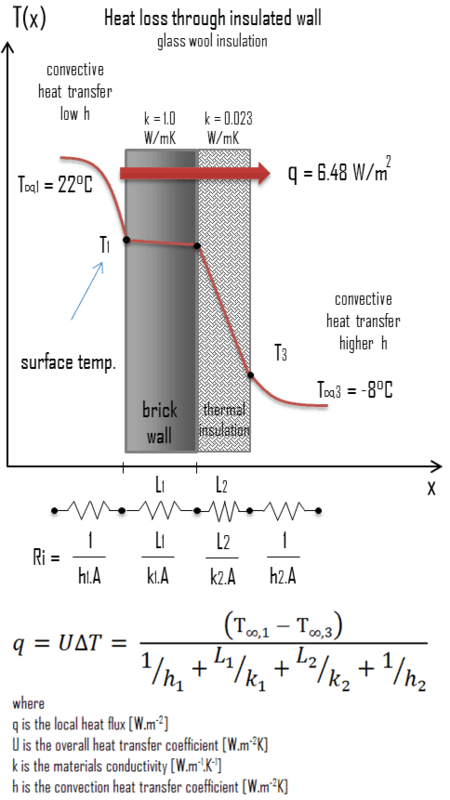 Use glass wool insulation 10 cm thick (L2) with the thermal conductivity of k2 = 0.023 W/m.K and calculate the heat flux (heat loss) through this composite wall.